Researchers at Cern in Switzerland have proved the merits of a way to test antimatter as a source of the long-postulated "anti-gravity". Antimatter particles are the "mirror image" of normal matter, but with opposite electric charge. How antimatter responds to gravity remains a mystery, however; it may "fall up" rather than down. Now researchers reporting in Nature Communications have made strides toward finally resolving that notion. Antimatter presents one of the biggest mysteries in physics, in that equal amounts of matter and antimatter should have been created at the Universe’s beginning. Yet when the two meet, they destroy each other in what is called annihilation, turning into pure light. Why the Universe we see today is made overwhelmingly of matter, with only tiny amounts of antimatter, has prompted a number of studies to try to find some difference between the two. 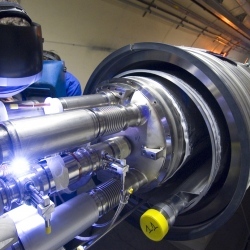 Tests at Cern’s LHCb experiment and elsewhere, for example, have been looking for evidence that exotic particles decay more often into matter than antimatter. Last week, the LHCb team reported a slight difference in the decay of particles called Bs mesons – but still not nearly enough to explain the matter mystery. One significant difference between the two may be the way they interact with gravity – antimatter may be repelled by matter, rather than attracted to it.